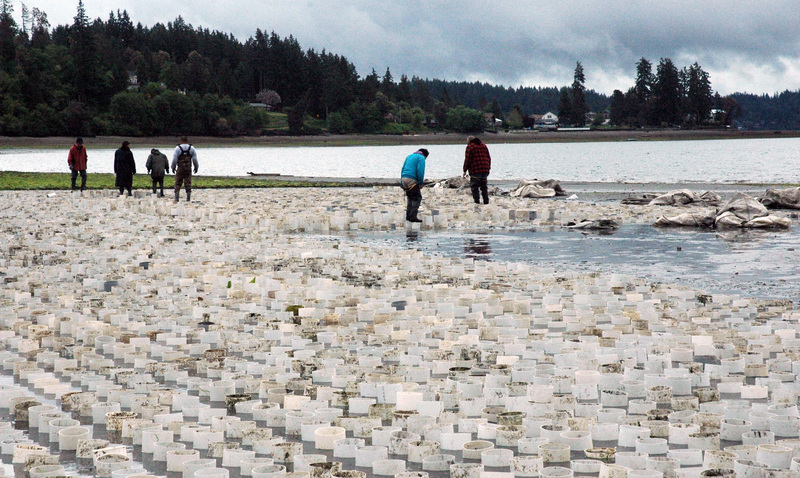 The equipment used to farm geoducks, including PVC pipes and nets, might have a greater impact on the Puget Sound food web than the addition of the clams themselves. That’s one of the findings of the first major scientific study to examine the broad, long-term ecosystem effects of geoduck aquaculture in Puget Sound, published last week in the International Council for the Exploration of the Sea’s Journal of Marine Science. The study also found that under one scenario, geoduck farming in the main basin of Puget Sound could more than double before the ecosystem would feel significant impacts. To reach these conclusions, a team of researchers from the University of Washington and the National Oceanic and Atmospheric Administration’s Northwest Fisheries Science Center used a robust, well-established modeling tool that examines relationships among many types of organisms in central Puget Sound. 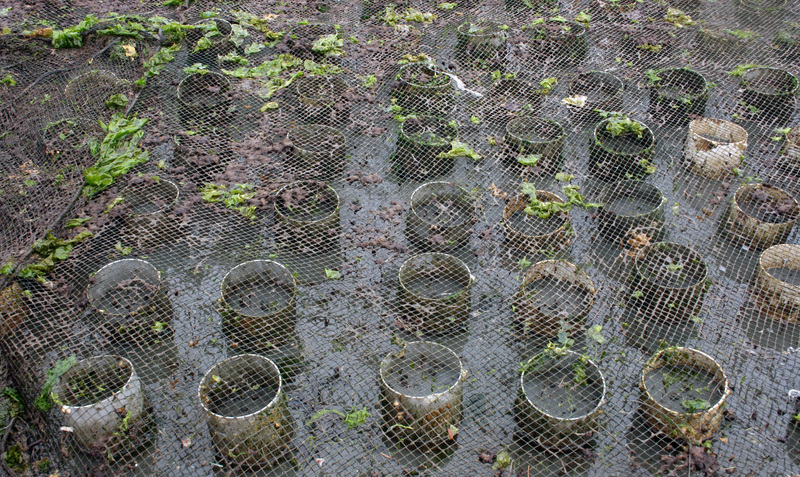 The researchers incorporated field observations from five years of studying geoduck farm conditions, then used the model to predict effects on the food web over 50 years if geoduck aquaculture increased. They found that farming activities altered the nearshore habitat, which in turn affected usual predator-and-prey interactions among species throughout the food chain in Puget Sound. The addition of thousands of phytoplankton-eating geoduck clams to the Sound didn’t actually affect the ecosystem over time. The researchers also found that aquaculture impacts became significant when geoduck farming activities increased by 120 percent over current levels in central Puget Sound. In 2012, about 23,000 pounds of geoduck were harvested from that area, which stretches from the Tacoma Narrows up to the south end of Whidbey Island. That’s about 2 percent of the total amount harvested from the South Sound, which in 2012 was about 1.1 million pounds. It’s the first time researchers have looked at both the effects of farming equipment and the presence of more geoduck clams on an entire ecosystem over time. This study, one of several funded by the state Legislature and overseen by Washington Sea Grant, found that more than doubling geoduck farming efforts in central Puget Sound could negatively impact salmon, eagles and great blue herons. Small crustaceans and moon snails might also decrease. Surf perch and small crabs fared better in this scenario, probably because they can find refuge and benefit from added farming structures like plastic piping and nets. 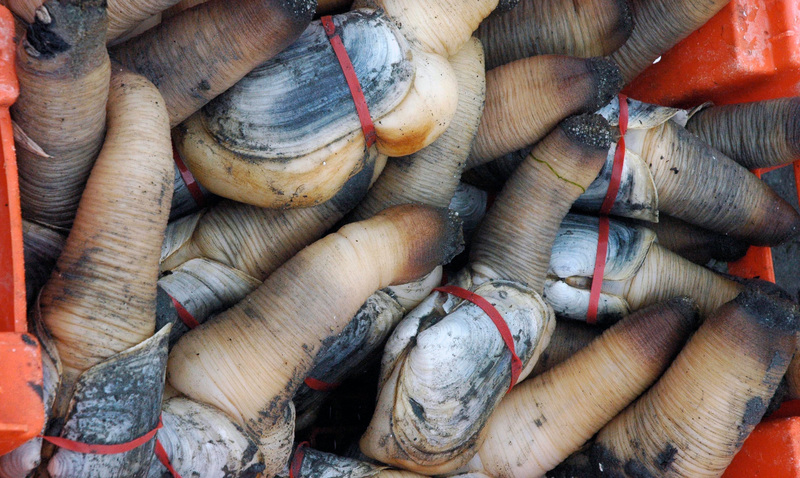 Geoduck farming is a controversial activity in Puget Sound. 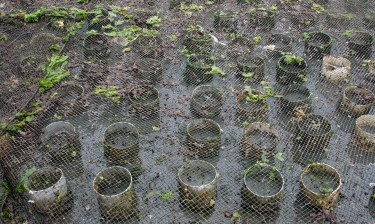 Some residents and members of the community object to farming methods, which include rows of PVC pipes placed in the shallow water close to shore to allow the young clams to grow without being preyed upon. Harvesting geoducks involves injecting large volumes of water to loosen the ground around each clam. 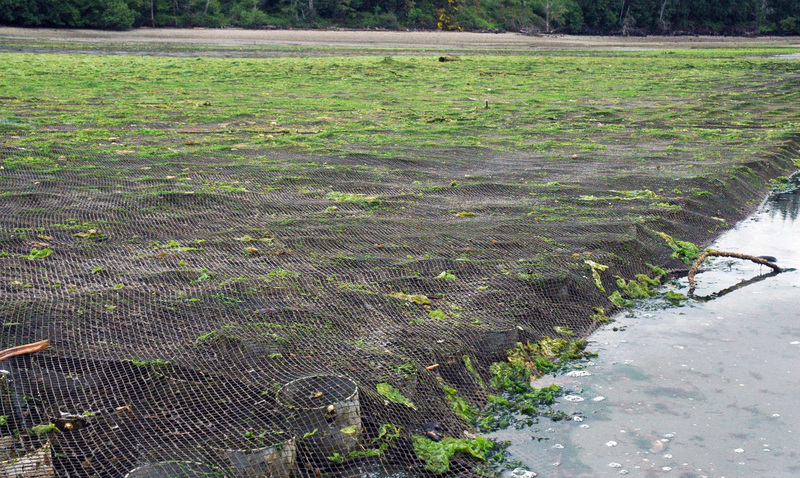 Meanwhile, the shellfish industry and local tribes wish to expand geoduck aquaculture throughout Puget Sound, and the state’s Department of Natural Resources recently approved a pilot leasing project on state-owned aquatic land. Most of the region’s current geoduck farming takes place in the South Sound. 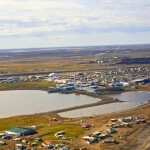 The researchers, however, analyzed central Puget Sound for this study because the best model for predicting broader future impacts was built for the central basin alone. A similar model is being developed for the South Sound by an independent team and when it’s ready, the researchers hope to compare results in order to consider impacts to the broader Puget Sound region. Many of the animals and birds potentially affected in central Puget Sound also live in the South Sound, so it’s reasonable to expect some similar outcomes, they said. 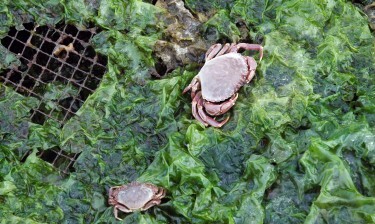 “This is a starting point that can be used to help focus attention on certain aspects of the system, such as species of interest, to collect more empirical data and further test these model results,” said lead author Bridget Ferriss, who completed the research as a scientist at Washington Sea Grant and is now a postdoctoral researcher at the UW. 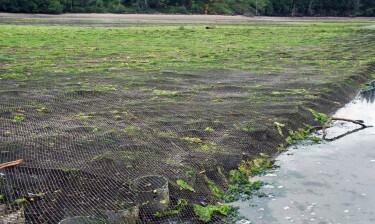 Though these results show that Puget Sound can generally support more geoduck aquaculture, if effectively managed, the model can’t drill down to specific inlets or bays and predict how organisms would react at a finer scale to increased farming, researchers said. Further studies are needed to determine the potential impact of more aquaculture activities on specific areas of the Sound, they added. Other co-authors are Jonathan Reum of Washington Sea Grant; Dara Farrell of UW mechanical engineering; and Northwest Fisheries Science Center’s Chris Harvey, who developed the model. This study was undertaken by Washington Sea Grant, in part with funding from a 2013 state proviso to study possible effects of shellfish aquaculture on the environment. Other recent publications from the research team cover the development of modeling tools useful for addressing changes in shellfish management in the South Sound and ocean acidification in coastal estuaries. For more information, contact Ferriss at ferriss@uw.edu or 206-543-8960 and McDonald at psean@uw.edu or 206-221-5456.